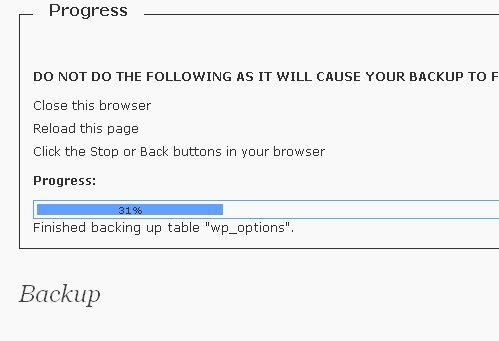 WordPress strongly recommends that you backup your database at regular intervals and before any wordpress upgrade. You can use phpMyAdmin to backup your WordPress database or can use MySQL commands directly. The easiest and simplest way to backup your database contents is to use the WordPress database backup plugin called WP-DB-Backup. You can restore your database from backup if something goes wrong. 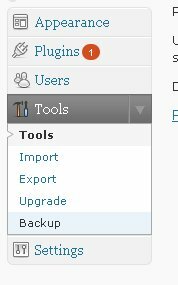 This WordPress Database Backup Plugin is one of the WordPress must have plugins which I mentioned earlier. WP-DB-Backup plugin allows you easily to backup your core WordPress database tables. You may also backup other tables in the same database. Tables : Core WordPress tables like wp_comments,wp_links, wp_options, wp_postmeta, wp_posts, wp_term_relationships, wp_term_taxonomy, wp_terms, wp_usermeta, wp_users will always be backed up. Backup Options : You can choose to save the .sql file to server , download to your computer or Email backup to your preferred email address. Make sure that you DON’T close, reload or click the Stop or Back buttons of your browser while the backup is in progress. Download and install WP-DB-Backup plugin from here. Next post: How to Split or Merge PDF Files for Free ?